I teach LOTS of classes and I love teaching. Many of my classes are designs I have developed myself over the last 10 years as my own personal techniques. I like FAST and IMPRESSIVE techniques in jewelry and fiber. In most of the jewelry classes you will leave wearing your new finished piece of jewelry that YOU made. My students tell me repeatedly how many compliments they get on their new pieces of "wearable art". This page is for my students to be able to "shop" for the class they want to take. If the class isn't on the current schedule, please email me to request it and I will get it on the schedule. To make sure you are on the current email list to get the class schedule email me at dvmeow@aol.com. Class signup requires a deposit of 1/2 the class fee to hold your spot. There is no other fiber technique as immediate and gratifying as nuno felting wool onto silk chiffon. The resulting scarf will be one of a kind and show your artistic flair. This is an all day class (usually 10-4) and you will make 2 nuno felted scarves, one simple and one more complicated! Kit includes wool, yarns, sparkle, hand dyed silk chiffon scarves and more These scarves are a $148 average value each! Wet felting wool into a purse is easy and requires no sewing. You end up with a seamless bag that is one of a kind and designed by you with my guidance. In the first part of class we will wet felt our purse and handle. In the second part of class I will introduce you to needle felting embellishments such as the Koi fish and yarn to your bag. Kit fee $40 Kit includes wool, sparkle and embellishments, as well as a needle felting kit so you have the tools to go home and felt your little heart out! My whole felting obsession began with these needle felted animals. Once you learn how to make the cat you will have the knowledge required to needle felt any animal your heart desires. Kit includes wool, wire and a needle felting kit. In this incredibly easy class you will learn how to "paint" with fiber. We will create an underwater garden scene suitable for framing. Learn how I created a beautiful sunset scene of Murano by making my own prefelts then wet felting them onto a purse, followed by needle felted details. Prefelts are also great on nuno felted scarves. We will wet felt a small piece so you can see how to apply prefelts and make them work for you. Kit includes wool and embellishments. Many spinners are intimidated by art yarn but I am here to change that! There is nothing more fun than creating your own one of a kind hand spun art yarn. I will introduce you to my "salad toppings" and show you how to add all kinds of goodies into your beautiful yarn. Bring your spinning wheel or call and reserve one of ours. Kit fee includes 4 oz of gourmet fiber and a romp thru Dr. Meow's amazing stash of embellishments to use in your yarn. This bracelet was created by Dr.
and tricks to make it easier. and Dr. Meow calls it "no brainer" metalsmithing. We will construct a bracelet of fused silver rings and also our own handmade toggle. Dr. Meow will show you several other variations as well. Kit includes 1 oz fine silver, sterling silver jump rings, use of butane torch and basic metalsmithing tools. In this class you will learn a special technique Dr. Meow developed to look like "coral" with her lampwork glass seashells. This is a needle weaving seed bead technique but is not hard, beginners welcome. You will finish you pendant in class an wear it home! This is a very good class for an introduction to bead weaving. We will use Swarovski crystal, Soft flex and seed beads to make a bracelet an earrings. This is one of Dr. Meow's favorite weaves for FAST results. Kit includes seed beads, Swarovski crystals, sterling silver toggle, crimp beads and ear wires. This is a beautiful variation of spiral rope that works up relatively quickly. We will be needle weaving beads with Fireline. This class is one that some students will not finish in class. Dr. Meow will help you finish later if you are having trouble! This technique is so fast and fun for encasing special gemstones, glass and shells. Dr. Meow will bring a variety of stones to class for the students to choose from. Kit includes gemstone or glass cabochon, fine silver wire, crystals and pearls. You know Dr. Meow is all over any new Swarovski related technique! Students will learn how to use this great new media to set Swarovski stones into a ring, pendant, earrings or purse compact. Kit fee includes Swarovski crystals, base (ring, pendant, etc. ), and DeCoRe media. Hot glass is FUN!!! Learn how to etch dichroic glass to create artistic images for pendants. We will finish the pendants but students will need to return to pick them up the next day after a kiln firing. Kit includes prefired dichroic glass piece and tools. This bracelet combines peyote stitch and branched fringe for stunning beadwoven project. Dr. Meow provides one of her lampwork flowers for each kit for the flower and loop clasp. This bracelet will not be finished in class but you will learn everything you need to know to complete the rest at home. 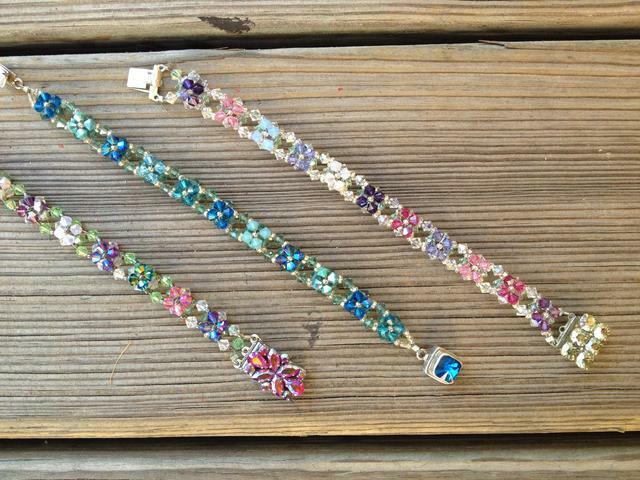 Kit includes 4 different types of Miyuki seed beads, Fireline, needle and lampwork flower. CHILI PEPPER CAT PAINTING WITH MARY SMITH OF RED HOT KITTIES! Join Mary for a fun day of painting! For this 3 hour workshop demonstration kitty will be painted on a 16x20 canvas using acrylic paint. Mary will share her folk art kitty painting style and layered painting technique, and you may choose your own cat colors if you wish to purr-sonalize. Mary is known for her great whimsical style and is truly LOVED by Dr. Meow! Kit includes one 16x20 stretched canvas, chalk, plain tissue paper, 3 art brushes, 1 chip brush, sandpaper, use of acrylic and craft paints, decorative stamps, modge podge and water based gloss polyurethane provided by instructor. This class is offered in 2 three hour sessions. In session one Fran will show us her original sculpting techniques done by HAND to sculpt your sea turtle. Fran will then fire the turtle and you will return in session two to paint your turtle! Lampworking Classes with Doretha Jones, Dr. Meow in person! Dr. Meow will help you compose a bracelet or necklace from whatever materials you choose (Lampwork beads, Swarovski crystals, silver, pearls, gemstones) and teach you how to use crimp beads, Soft Flex and crimp covers for a professionally finished piece. We will discuss color and composition and common pitfalls when designing with beads. 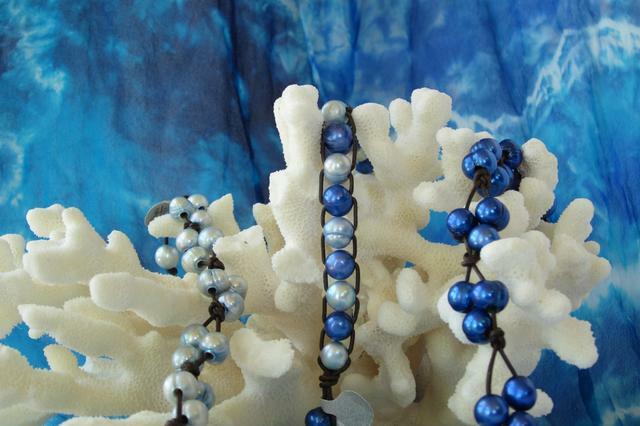 In this class you will learn how to make the freshwater pearl and leather bracelets that everyone is wild about! We will discuss how to safely drill freshwater pearls with big holes for threading onto leather and how to knot and finish the bracelet. Several different bracelet patterns are offered for you to choose from. This is a relatively simple right angle weave bracelet in two layers. Simple enough for beginners, we will use Swarovski Crystal, seed beads and Soft Flex to create this knockout bracelet. I learned this originally from Carol Hatcher but I have made changes to the pattern that make it easier and faster to finish! Your kit fee includes a beautiful Swarovski crystal sterling silver clasp. You will finish the bracelet and wear it home to amaze your friends! Kathy makes these amazing and durable purses out of recycled sweaters! She provides a very sturdy form to build your purse on and shows you simple hand sewing techniques to put it together. then comes the fun part, decorations! Kathy will show you several ways to use recycled felted sweaters to embellish your bags plus simple knitting and crocheted yarn embellishments as well! 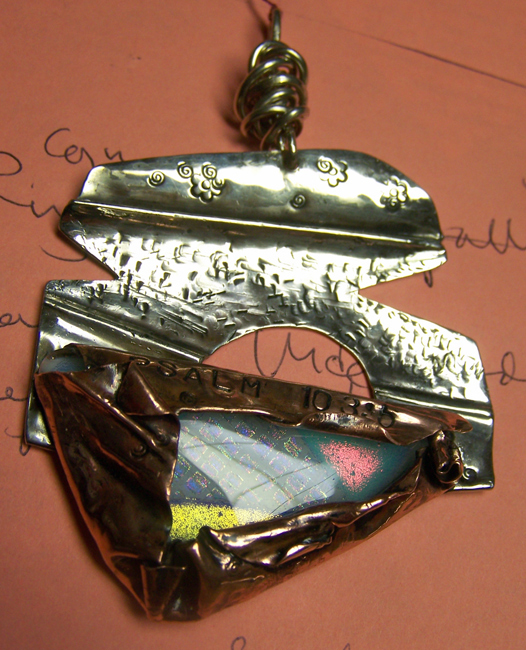 Mary is a master of many media and has done much exploration in metal forming. "Form folding" metal is easy to learn and allows you to create fascinating dimensions in metal. We will start with cutting and shaping (shears and file) then hammering, stamping, torching, basic riveting and very simple soldering. We'll attach (w/solder and rivets) a folded metal bezel as a setting for a beautiful piece of dichroic glass to complete our pendant and finish the piece with a simple hammered and coiled wire bail. Take home handout with step by step instructions will be provided. Dennis Boyce is an accomplished artist in both watercolor and acrylic media. He is one of our favorite "Bad Boys" and a great teacher. 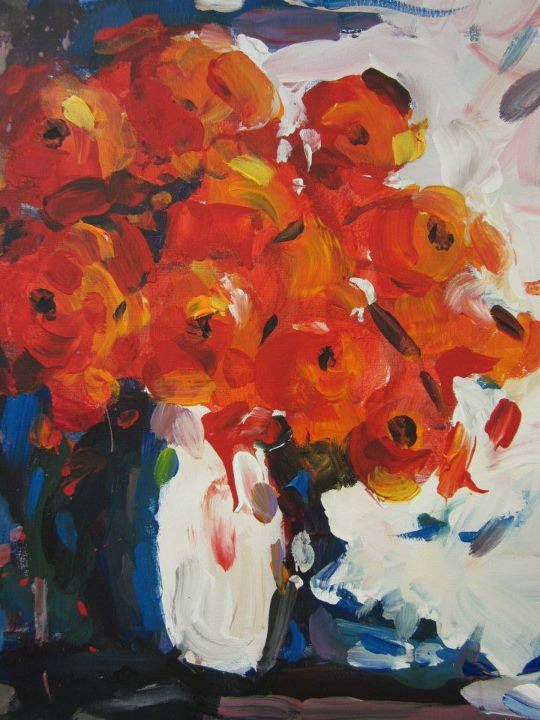 In this class he will teach his impressionistic acrylic techniques to complete a still life painting. A supply list will be provided when you sign up for class if you prefer to bring your own supplies for class. This class is true immediate gratification! Ann brings the doll already sewn and then the students get to decorate and stuff it with her direction. She helps guide you in painting the face, applying the fabric for the tail, adding hair, headress and other decorations! Ann is an enthusiastic and fun teacher. This is the doll I made in class and it was so fun! In this class Barry will help you COLOR one of his amazing black and white art prints, MANY to choose from! In Barry's own words: "No one ever teaches you how to color! There is a whole art to it and you can do so much to emphasize different elements of the print" Looking at Barry's astounding work I saw exactly what he was talking about as I saw the same print colored in an entirely different way. Barry was at Woodstock! He is the ultimate cool artist and his prints have all sorts of hidden images and amazing detail. His work is reminiscent of M.C. Escher's art. Class Fee $25 Kit fee $50 (18x24 Barry Rose art print!) bring your own colored pencils or crayons! Make this cute ring with one of Dr. Meow's flameworked Murano glass flowers. This class is very rewarding and easy! You will use a ring mandrel to create your ring and learn a simple band wrapping technique to make the ring look finished. Kit includes sterling silver wire in 2 shapes/gauges and handmade glass flower bead. 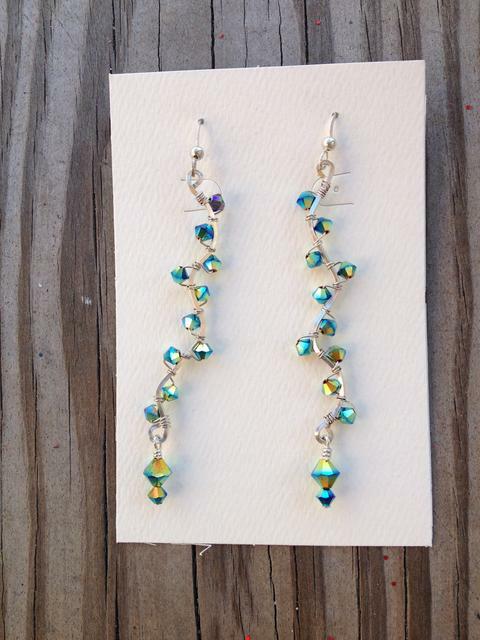 These earrings were inspired by some Alicia Keys had on in a magazine. These can be mild or wild depending on your style! We will use sterling silver wire in 2 gauges to make our earrings armature and then wrap Swarovski crystals around it.